Perfect for any spicy flavor lover. Great on anything that needs a zing. Adjustable grinder for desired size. Experience the freshly ground full flavor and tangy heat of Dean Jacob's Habanero pepper blend. Crafted with wonderful delicious herbs including: garlic, sea salt, onion, sugar, citric acid, red pepper, ancho chilli pepper and fiery habanero peppers. 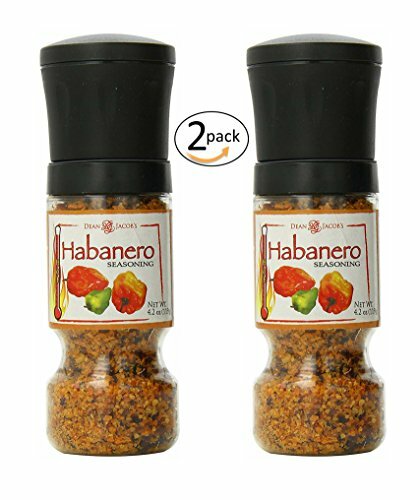 Try this Habanero seasoning blend on dry foods like popcorn and potato chips, or use in foods like sandwiches. We're partial to grinding habanero spice on roasted potatoes and veggies, and it's especially handy when you want to give a rich boost to mexxican recipes and stir fry or liven up a quick meal. A masterful blend of garlic, sea salt, onion, sugar, citric acid, red pepper, ancho chilli pepper and fiery habanero peppers. If you have any questions about this product by Dean Jacob's, contact us by completing and submitting the form below. If you are looking for a specif part number, please include it with your message. Advance Pierre Jumbo Jalapeno Cheeseburger, 6.65 Ounce - 12 per case. Badia Sazon Caliente Seasoning Spice, 5.75 Ounce - 12 per case.